Photo by Miles from the Torontoist Flickr Pool. The popularity of the Uber private driver service has forced cities around the world to take a hard look at their taxi licensing systems. London, long famous for the tough preparation demanded of those seeking a licence to drive the iconic black cabs (‘The Knowledge’), not to mention the £8,000 fee the drivers pay, now has 150,000 individuals available to drive for Uber passengers. These drivers use GPS rather than their brains, so if a particular tourist attraction requested by the fare is not marked on Google maps, the hapless tourist will be out of luck. The official black cab business has been seriously impacted; but no official action against Uber has yet taken place. In Montreal, the municipality has seized 40 Uber vehicles since early 2015. In Toronto, it has been the taxi companies that have led the protest against Uber, especially Co-op Taxi, which has sought to create fear about unlicensed drivers among female passengers. The city did seek an injunction against UberX in November, but the case has been postponed twice, until June 1. It is doubtful that Toronto officials will start seizing Uber cars or otherwise throwing the book at the company, since Mayor John Tory has undermined the licensing department’s prosecutorial zeal by publicly calling for a compromise between officials and Uber. Uber may think it has offered a compromise in the shape of UberTaxi, an app that facilitates getting a regular, licensed taxi. But most of its revenue comes from UberX, the service that links private drivers to passengers, and it is UberX that is the source of concern in Toronto as elsewhere. Many people think that until UberX emerged, “First World” cities had successfully eliminated the unmarked taxis one finds in airports and urban streets in the Global South. That is a myth. While Toronto does not seem to have a significant black market for illegal taxis, in New York, the classic yellow taxi cab, sporting an expensive “medallion” or plate, is in a minority: a much larger number of for-hire black cars quietly do taxi work, though they are not allowed to cruise the streets. Partly for economic reasons and partly due to an old-fashioned licensing system, the classic yellow taxi of Joni Mitchell fame only exists on the island of Manhattan. Everywhere else, people have to phone for a car and wait. Similarly, in London, UberX is not unique: private-hire vehicles (mini-cabs) had proliferated well before Uber appeared, and indeed outnumber the classic licensed black cab three to one. All of this suggests that Uber has not caused a problem: the rise of Uber is merely a symptom of an underlying condition. The same malady, regulatory sclerosis, has long affected other entrepreneurs of urban life—most notably, actual and potential street food entrepreneurs. Regulatory sclerosis is well known (by various names) to those public administration and governance specialists who study the everyday working of regulatory authorities. Their research shows that official, legal regulation cannot get too far away from what is sensible or else it will fall apart, as liquor prohibition famously did. If the rules for getting a taxi licence are too strict and onerous, a black market or an alternative like Uber is bound to develop sooner or later. 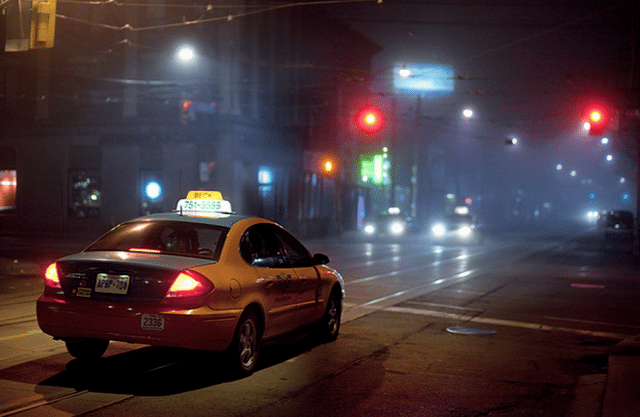 Before the arrival of Uber cars, the only regulatory effort made by the city of Toronto in relation to taxis was the introduction of the “Ambassador” licence. Originally the City (especially former councillor Howard Moscoe, Ward 15 Eglinton-Lawrence) wanted to eliminate the old system of plates because over time some people, including former taxi drivers, had accumulated several plates, and rented them out to new drivers at extortionate rates. New plates were not being issued, which meant that existing plate owners could retire to Florida and collect unearned rents from struggling drivers. The city’s proposed solution to this was to eliminate the absentee plate owners altogether, making taxi work into a self-owned and self-operated business. That plan was illegal, however: like other licences, plates are considered legally as a type of property, and municipalities cannot expropriate property other than land. So the city was forced to leave the old plate system alone. The new rule was that, going forward, all new plates would be of the Ambassador type—which prohibit renting out either the plate or the car itself. That’s like saying to a café owner that he or she cannot ever hire employees. Caught up in the myth of the small self-owned business run by hard-working immigrant entrepreneurs who eventually do well, city officials and councillors did not consider the fact that the new Ambassador drivers would end up working 12 or 14 hours per day (and never taking any holidays) in order to repay their loans. Forcing the licensed taxi to sit idly while the driver sleeps (or if the driver is sick or injured) is hardly conducive to drivers ever getting out of new-immigrant poverty, not to mention the dangers posed to passengers and to traffic in general by sick or overtired drivers. The Ambassador system in fact created a system of extreme overwork for the new plate owners—and also encouraged illegal renting, since no-one can drive 24 hours per day. Today, Toronto continues to have its taxis divided into “traditional” plates/taxis and Ambassador plates/taxis. A few years ago, a Ryerson University study showed that many drivers were earning $5 or $6 an hour. The lower price of gas may have increased their earnings somewhat this year; but clearly, city leaders’ wrongheaded attempt to impose the Ambassador plate system as a means to limit taxi capitalism was a failure. (The hot dog vending business, incidentally, is also hobbled by similar rules that prevent business owners from hiring employees as brick-and-mortar restaurants do). It is of course true that the old taxi plates had given rise to nasty capitalist practices. But the fact that some restaurants exploit their kitchen staff does not mean that banning employees altogether would be a great idea. Not surprisingly, then, the Ambassador taxi licensing reform was counterproductive. Looking back at the Ambassador story does not inspire confidence in the city’s ability to come up with sensible rules for Uber cars and drivers. Why is it so hard for cities-such as Toronto-to come up with sensible rules for the tiny proportion of the local economy over which they have regulatory power? At the federal level, the heavy hand of the criminal law can be used-up to a point-to impose rules, though even the threat of criminal sanction does not always make activities disappear, as marijuana users well know. But at the local level, regulatory teeth are often missing in action, both because of lack of policy capacity, lack of enforcement personnel, and, probably most importantly, because municipal powers, in law, are very weak. Municipalities cannot imprison or detain anyone, and they cannot impose fines in many potentially serious situations, such as rooming house bylaw violations. Indeed, the reason why parking enforcement is zealous by comparison with bylaw enforcement in parks and streets is that municipal fines are allowed for parking infractions. Confronted with a negligent landlord, all the city can do is send in a contractor and hope that the landlord will eventually pay the sum appearing on the property tax bill: that situation is hardly an incentive to hire more people to enforce the rules. As against their general powerlessness, small business licensing is one area in which cities, including Toronto, have the power to impose a plethora of rules. A curious fact is that the size of the regulatory structure seems to vary in inverse proportion to the size of the business. Banks and big corporations need no municipal permission to operate, and pay only regular property taxes. But anyone wanting to operate a hair salon, drive a taxi, or open a small independent restaurant faces a Kafkaesque labryinth of rules. And even after emerging with all 17 or so required permits at the other end, such small entrepreneurs often face random harassment by bylaw officers. The well-known troubles of the small entrepreneurs who naively invested in the A La Cart street food program are only the tip of the iceberg. Part of the problem is that small-business licensing is a function of Municipal Licensing and Standards, a department that, compared to Planning or Economic Development, lacks policy capacity. But ultimately, bylaws are passed by city council. So the main responsibility for dysfunctional local regulatory systems lies with elected councillors, who in Toronto have historically ignored the licensing and standards committee–perhaps because food vendors and taxi drivers don’t count as much, electorally, as a single well-organized residents’ association. The Uber controversy could be an opportunity for our elected representatives to finally take responsibility for the dysfunctional taxi regulation system that they (or more accurately, their long-gone predecessors) have set up. There are experts who would be happy to contribute expertise as a public service (I would certainly volunteer). But in this, as in every other area, effective regulation does not come from experts alone. Sensible regulation is a collaborative process in which expertise and information about other jurisdictions is shared with service providers and consumers: they are the ones who can say what ideas from other places will work locally, and who can spot defects in regulations before they are enshrined in law. In other fields (environmental law, for instance) authorities all over the world are learning about “smart regulation”–that is, regulatory systems that are effective but are not unrealistically onerous or overly prescriptive. Smart regulation doesn’t enforce a rule because “we’ve always done it this way” or because the regulation in question is the only one within municipal jurisdiction. Smart regulation requires doing research on the risks posed by a particular activity and then developing regulations that target only those risks. In relation to taxis, the convenience and safety of passengers should be major concerns; but the working conditions of the drivers, which have not been protected by either the old plate system or the Ambassador system, are also important. A policy process could be put in place that considers taxis and Uber vehicles together and comes up with sensible rules. The Uber controversy could be the start of something Toronto has never had: a sensible small-business regulation system. Mariana Valverde is a professor at the Center for Criminology and Sociolegal Studies at the University of Toronto, where she focuses on urban law and governance. Valverde is the author of six books, including Everyday Law on the Street, a book that looks at Toronto’s bylaws, their enforcement, and consequences.